Mustard seeds have been highly prized medicinal as well as spice being in use since earlier times. The seeds are fruit pods obtained from mustard plant in the Brassica family. Some of close members of mustards in this family include cabbage, broccoli, brussels-sprouts, etc. Scientific name: Brassica juncea. Mustard seeds are native to Asia Minor, but these days cultivated as one of the main commercial crop in Canada, India, China, and temperate climates of European region. Mustard seeds are winter crops. The plant reaches about 4-5 feet in height and bears golden yellow colored flowers. Its tiny, round seeds measuring about one mm in diameter is encased inside a fruit pod in a similar fashion like green pea pod. White mustard seeds (Brassica alba): The seeds are light straw yellow colored and are slightly larger than the other two varieties. White seeds exhibit mild pungency. 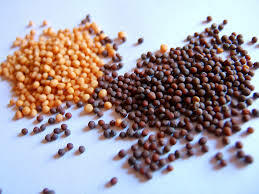 Black mustard seeds (Brassica nigra): The seeds are commonly seen in South Asia. The seeds are sharp and more pungent than other two varieties. Brown mustard seeds (Brassica juncea): The seeds are native to sub-Himalayan plains of Northern India. Being one of the chiefoil seeds, mustards are indeed very high in calories; 100 g of seeds provide 508 calories. Nonetheless, the seeds are made of quality proteins, essential oils, vitamins, minerals, and dietary fiber. The seeds are high inessential oils as well as plant sterols. Some of important sterols include such asbrassicasterol, campesterol, sitosterol, avenasterol and stigmasterol. Some of glucosinolate and fatty acids in the seeds include sinigrin, myrosin, erucic, eicosenoic, oleic, and palmitic acids. Mustard seeds are an excellent source of essentialB-complex vitamins such as folates, niacin,thiamin, riboflavin, pyridoxine (vitaminB-6), pantothenic acid. These vitamins are essential in the sense that body requires them from external sources to replenish. These B-complex groups of vitamins help in enzyme synthesis, nervous system function and regulating body metabolism. 100 g of mustards provide 4.733 mg ofniacin (vitamin B-3). Niacin is a part of nicotinamide co-enzymes, helps lower blood cholesterol and triglyceride levels. The seeds are an excellent source of vitamin E,gamma tocopherol; contain about 19.82 mg per 100 g (about 132% of RDA). Vitamin E is a powerful lipid soluble antioxidant, required for maintaining the integrity of cell membrane of mucus membranes and skin by protecting it from harmful oxygen-free radicals. Mustards are rich source of health benefitingminerals. Calcium, manganese, copper, iron, selenium and zinc are some of the minerals especially concentrated in these seeds. Calcium helps build bone and teeth. Manganese is used by the body as a co-factor for the antioxidant enzyme superoxide dismutase.Copper is required in the production of red blood cells. Iron is required for the red blood cell formation and cellular metabolism. Whole mustard seeds have no smell at all. The hot pungent taste of mustard is released when the seeds are crushed and mixed with water due to activation of enzyme myrosinase. In the spice stores one may find all varieties of whole seeds, ground seeds, pastes and different mustard sauces. Whole, dry mustards keep well for months at room temperature when stored in cool, dry and humid free conditions. However ground seeds and other preparations of mustards should be kept in tight, air seal containers and placed inside the refrigerator for a prolonged shelf life. Mustards are used extensively in Indian, Pakistani, Bangladesh, Mediterranean and German cooking. Whole seeds, ground or powdered form, prepared pastes, sauces and oil are all used in cooking. The aroma and pungent flavor of mustards come from the essential oil, sinalbin. This compound releases isothiocyanate chemicals upon enzymatic reaction mediated by myrosinase. Mustards exude pungent nutty flavor when gently roasted under low flame. Brown as well white mustard seeds are used in pickling with raw mango,bitter gourd, etc, in India. Mustard fish curry, prepared with thin mustard paste,coriander powder,chilies and nigella is popular in Bangladesh and West Bengal in Indian subcontinent. Different kind of mustard seeds uses mustard seeds mixed withherbs, spices, honey, tomato, etc., in many parts of the world. Mustard paste is used in salad dressings, sandwiches, and hot dogs and in mayonnaise. American mustard is prepared with white seeds, vinegar, spices,turmeric and sugar. Mustard oil is used in many North Indian and Pakistani recipes. In general mustard seeds and its oil consider being safe for human consumption when used in small amounts. Large quantity of mustard may cause gastric irritation, bleeding from stomach and intestinal mucosa. It may cause skin burn when applied over skin for longer time. Erucic acid in musatrds has been found to have possible genotoxic and carcinogenic effects in laboratory animal studies.